A ten hours tour that will take you to visit the beautiful city of Évora, a World Heritage Site, Almendres Cromlech and the beautiful village of Monsaraz! After the hotel pick-up, we will take you to South, crossing the “25 de Abril” bridge. The landscape will start to change after getting Alentejo region. The olive trees, the cork trees, the immense plain, the golden soil, the blue sky… Alentejo will overflow your senses! Visit to the Almendres Cromlech, a testimony of pre-historic Human presence in Alentejo. 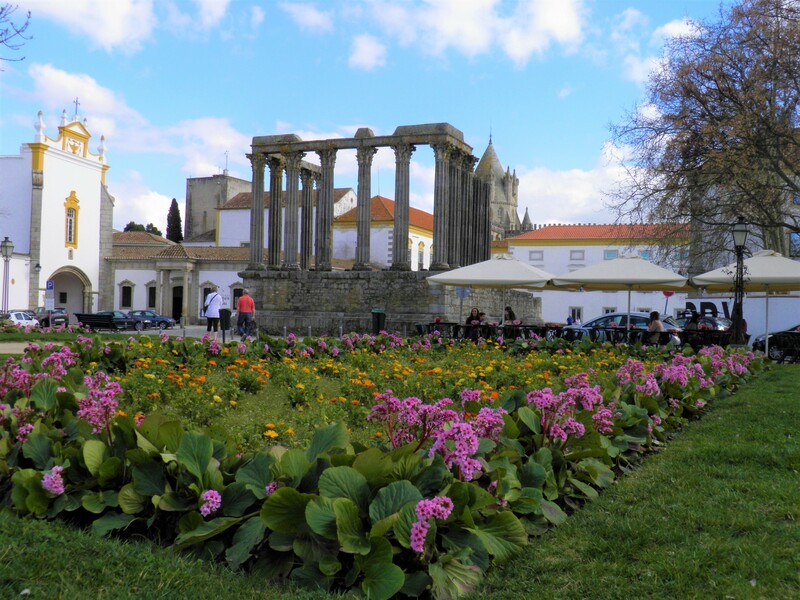 The city of Évora counts thousands of years of History. We will take you to know the city highlights and will tell you its 1001 stories. Appreciate the beauty of this magical city. The city historical centre is a total surprise. Inhabited since immemorial times, it is still possible to appreciate Roman remains, surrounded by medieval buildings. Visit the historical centre, the Cathedral and the Bones Chapel. After, we will take you to Monsaraz, a beautiful medieval village at the top of a plateau, where you will be able to see the Alentejo magical plain. Come with us to Alentejo, the enchanted region of Portugal! This city tour takes place from Tuesday to Sunday. Not included: Food and drinks, unless specified. Tickets to the museums. Tickets: Évora Cathedral and Bones Chapel: Adults 4€, Youth 3€, Senior 3€. We recommend: Comfortable footwear and clothing. Meeting point: We will pick you up at your Hotel, Apartment, Airport or Cruise Terminal. For tours setting off from Sintra, Cascais and Estoril please ask for prices.